Do you consider yourself a hardy northerner? Do you feel a calling to protect the realm from all manner of monsters and creatures of the night? If you said yes to either of these questions, then you’re going to want to wear something that will keep you both warm and safe on even the coldest nightly watches. Any warrior of the north knows the value of a warm, fur trimmed cape. Whether you’re patrolling long, snow covered roads or venturing into frozen foreign lands, you need something that will hold back that biting chill and keep your sword hand from shaking. You could settle for any ratty old cape, but you’re a true northern warrior. You need a cape that is not only warm, but also stylish and that helps you blend into the night on those dangerous nightly patrols. Fortunately, we here at HalloweenCostumes.com have just the thing you need. 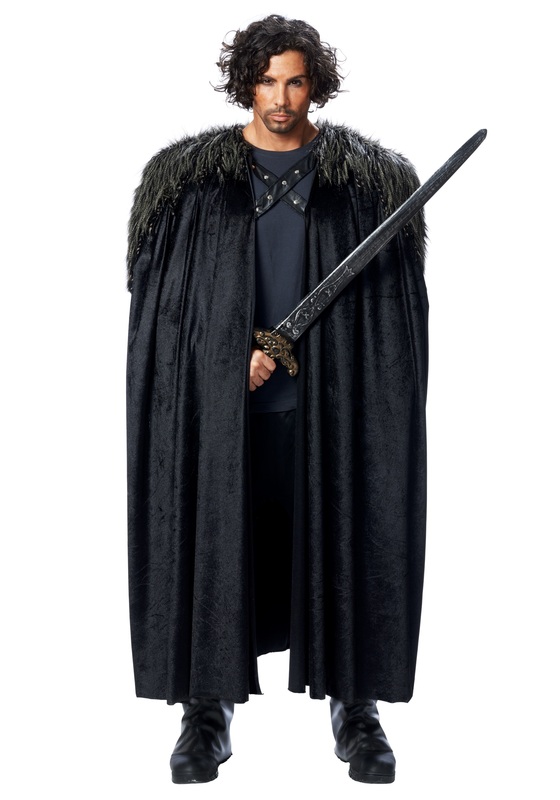 Look no further than the Medieval Fur Trimmed Black Cape. With its black and gray faux fur, this long black cape will keep you warm and safe in any situation. Not a big fan of capes but think cloaks ought to make a comeback? No problem! This super versatile cape also includes a set of arm holes, so you can switch from a cape to a cloak (or vice-versa) on the fly. In addition to being both practical and versatile, this cape is also incredibly stylish. In fact, it’s so stylish, you’ll have people calling you “milord” everywhere you go. Don’t forget to pick up one of our sword accessories for that authentic medieval warrior look! After all, you’re going to need something to defend against the monsters when they eventually come creeping out of the night.